At the moment I am reading Of Silver and Beasts by Trisha Wolfe. So far so good and the world building is definitely unique. Its a world where everyone covets mercury. I just finished reading a bunch of Julia Quinn novels. I started reading her Bridgerton's series and I love this particular family and all of their relationships. Their antics always make me smile. I finished reading The Viscount Who Loved Me, It's in His Kiss and Romancing Mister Bridgerton (which was my favourite out of the three). I actually have no idea what to read next. I feel like reading a good fantasy novel but I don't know what. I'm so indecisive when I need to pick a book to read sometimes. Let me know what fantasy books you recommend. 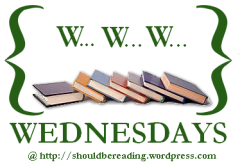 I hope you enjoy your books this week :-) Happy Reading! Hope you are enjoying your reads :) I am going to have to check a couple out. haven't heard of your books, but they sound interesting with the title alone. Thanks for droppin by my Wednesday post!